Each year as summer days begin to fade away, Southern Californians are rewarded with something else exciting to look forward to, or rather to eat our way through, the Los Angeles County Fair. Held at the Fairplex in Pomona, the fair has debuted a new theme this year, “Get Your Kicks.” Its exhibits pay homage to the historic Route 66 and the landmarks it runs through, particularly close to home in California. One of the greatest parts about the fair is discovering –and eating – all of the new, adventurous foods on display. Featuring deep fried filet mignon, peanut butter-jelly and sriracha funnel cakes, and ice cream sandwiched between cotton candy this years’ gluttonous possibilities don’t disappoint. Much to the detriment of our waistlines, we’ve scoured this year’s craziest fair foods for the best of the best to save you the money, and guilt. Surprisingly, the best culinary creation we discovered wasn’t full of sugar, deep-fried or wrapped in bacon. Instead of going over the top, the chicken ramen burrito combines three seemingly incompatible staples: Maui grilled chicken, Funyuns, and ramen noodles cooked with scallions and a sriracha sauce, all wrapped in a tortilla. The result is fair food gold. A mix of three modest ingredients, two of which could be bought at any 7-Eleven, proves just how well the Fair manages to turn lowbrow ingredients into an indulgent masterpiece. Much like its noodles-in-a-cup inspiration, the ramen burrito is also available with shrimp. Among the multitude of meats you’ll encounter at the fair this year, from massive turkey legs that look like they got caught up in the crossfit craze, to ribs that look like they came from a prehistoric beast, the most egregious display of carnivorousness is deep-fried filet mignon from Chicken Charlie’s. It is literally a hunk of the leanest, most tender beef, cooked medium rare, then dipped in a light batter and thrown into a deep fryer. Don’t get us wrong it’s good, but it would be just as good if you handed out the hunk of meat without the addition of the batter. Few things bring as much happiness as pizza and pasta, so when Eddie’s Cucina Italiana introduced their “4 on the Floor” pizza we were ready to ingest as many carbs as our bodies could handle with zero hesitation. The pizza-pasta hybrid features penne pasta with crema rosa sauce, grilled chicken, mushrooms, spinach, and marinated tomatoes atop a pizza crust. There is also a vegetarian option with pasta, crema rosa sauce, and mozzarella cheese. While it may be a less adventurous dish, it’s a must-try for any Italian food lover. 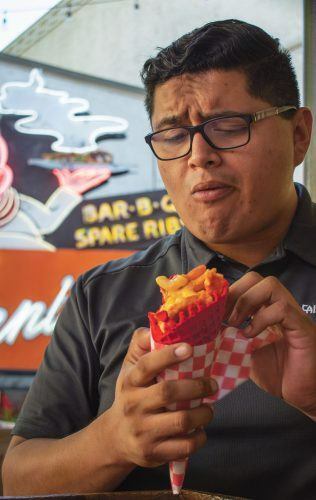 One of the only downsides to the Fair is the hefty price you’ll have to pay if you want to try all the deliciously fried, oversized, greasy food they have to offer. This year however, foodies and families don’t have to break the bank to indulge. The Los Angeles County Fair’s new concept is a value meal option paying tribute to Route 66, with unique treats and drinks priced at only $6.60. A few of our favorite finds were Pink’s Hot Dogs offering a quarter pound turkey dog with a 16 ounce drink, a combo featuring two sliders and colossal onion rings at Bubba’s BBQ, King Taco’s meat quesadilla and a 16 ounce drink, and Pineapple Express’ deep fried pineapples and drink. Granders went grand with half of a pork sandwich and slaw with fries and a drink and Bacon-a-Fair has a bacon dog and drink. For those who can’t take down a whole turkey leg, Juicy’s Outlaw Burger is serving up two turkey leg tacos and a drink. Chicken Charlie’s $6.60 special this year is a waffle cone filled with buffalo chicken and mac n’ cheese, served with a drink. Yes, it’s as good as it sounds. And yes, maybe better than the usual waffle cone fare, ice cream. The inexpensive fun doesn’t end with the meaty and fried, though. You can find the crowd favorite single scoop milky bun at After’s Ice Cream (we suggest the bright blue cookie monster), a trail mix chocolate donut at Texas Donuts, and a cookie sundae at Cathy’s Cookies. Pro tip: look for vendors displaying a California license plate to spot those participating in the $6.60 meal deal and thank us later. What’s the fair if not for indulgence and eating like you’re eight years old again? Afterall, the fair only comes once a year; so let’s delve into the most ostentatious sweets you’ll see this year. If there was an award for the most over the top offering it’d go to the “Caramel Crack Fries” from Biggy’s. This real-life menu option, straight out of a six year old’s dream, features fries drizzled with a sea salted caramel sauce, tossed in granular cinnamon sugar. That’s not all, the combo is topped off with whipped cream and Fruity Pebbles. Is it an insane combination? Definitely. But we can’t deny the insanity achieves the perfect balance of both sweet and salty and soft and crunchy. In terms of taste, think of an upgraded churro. One of the trendiest dessert crazes in the last year has been “dragon’s breath.” All over the internet and at food fairs are balls made of cereal and dipped in liquid nitrogen, so when guests bite into them, the vapor come out of the mouth and nose, giving it the name. Cowboy Kettle Corn has created a rainbow of UFO disks on a stick. The Nitro Sour Bomb is dipped in liquid nitrogen so that when you pull off and bite into each disk it releases vapor and a sour, powdery puff in your mouth. While not the most satisfying dessert, it’s easy to see the allure and social media popularity. The liquid nitrogen is also showcased in colorful popcorn which may be less exciting but has the edge on flavor. While not the wildest thing you could get, there are few experiences more satisfying than walking around the fair while munching on a literal bucket of freshly baked chocolate chip cookies from Cathy’s Cookies. Honestly, where else can someone walk around eating cookies the way you do potato chips and not get weird looks? And if you can stop at just one of these crunchy on the outside, gooey on the inside treasures, you deserve an award for self-discipline.